A rich textured night cream which helps revitalise the skin’s cellular function, while simultaneously helping to improve the overall look and feel by smoothing out the appearance of deep lines and wrinkles. 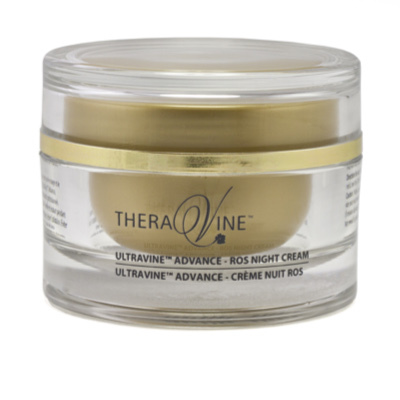 The UltraVine™ Advance ROS Night Cream contains a tetrapeptide, amongst many other active ingredients, that not only prevents the damage caused directly or indirectly by UV radiation to DNA and proteins, thus minimising photo-ageing, but also promotes the skin’s DNA repair system capacity. Additionally, it includes a plant based cosmetic active which offers a soft and velvety touch through the use of petals obtained from the white flowers, Pale Rose, Jasmine and Daisy, ultimately leaving your skin smooth and soft. Add to that an important ingredient that helps attract, retain and add moisture to the skin whilst scavenging free radicals.